Are you kidding me? I'm sure you started reading this and thought to yourself, a theory is already a truth, and you would be right. The Theory of Evolution, which hardly appears in Darwin's Origin of Species book, is a scientific fact, however it took writing this article to find out about the facts behind Darwin's research. Ultimately, Darwin’s theories and findings were built upon previous conclusions. Darwin’s lust for fame led him to publish his works built on the shoulders of others, thereby allowing his integrity to be questioned by his peers and mentors, and ultimately his informed opinions or hypothesis to be disproved by new evidence using fossil records which was Darwin’s greatest fear. Charles Darwin was born in 1809, and although at the time his grandfather Erasmus Darwin was pioneering the evolutionary movement before his death, Charles didn’t actually read his grandfather’s book until after his death. Erasmus Darwin’s research contained the seeds of almost all the essential principles of modern evolutionary theory including overpopulation, struggle and competition, and selection (Sunderland 14). It would be years until Charles Darwin actually accepted the theories that his grandfather had previously collected, so in the meantime, he settled for university life. Charles was rather bored and felt that as a student, he was rather dull. He was incapable of mastering a language, although he could memorize forty lines of poetry or verse. He would, however, forget them with a couple days. Charles Darwin’s father, not well-informed of his son’s lack of interest in the area of anatomy, still enrolled him in the medical school at the University of Edinburgh. Not surprisingly, Darwin was completely disgusted and found the lectures to be quite dismal. In his second year, he attended geology and zoology classes, but said in his Autobiography, “they were incredibly dull. The sole effect they produced on me was determination never as long as I lived to read a book on geology or in any way to study science. Yet I feel sure I was prepared for a philosophical treatment of the subject “(Sunderland 16). How odd, that a future evolutionist should find no interest in a profession that characterized his entire existence. Darwin’s father recognized that he was wasting his life, and so he enrolled him at the divinity school at the University of Cambridge. In the beginning, Darwin didn’t question the existence of God and the Bible, however he did begin to question his beliefs as he embarked down the same mundane and unexciting world he had once experienced at Edinburgh. He did, however, find solace in the collecting of beetles, which some scholars might say brought him fame. Two years after graduation, he set sail aboard the HMS Beagle as a naturalist in search of the evidence to support what his grandfather had previously studied. The voyage took five years, however after his return to England, those years of research prompted him to accept the idea of naturalism and the origin of all species. Of course, this theory of evolution by the mechanism of natural selection had already been mentioned years prior, so to that end, Darwin did not originate the concept. On July 1, 1858, Charles Darwin and Alfred Wallace presented their joint paper on evolution at the Linnaean Society in London (Darwin 10). Evidently, Darwin had been discussing his findings with a close group of friends, so the idea of evolution was already on the minds of men. Oddly, Alfred Wallace, another naturalist, wrote a paper in 1858 which described the identical hypothesis being discussed behind closed doors. Darwin read the paper and swiftly published one of his own, leading to the joint meeting in London. This wouldn’t be the first time that Darwin stole the limelight from another colleague. Why you might ask? Simply because Wallace didn't have the money to publish first. Imagine having Wallacinism! One year later, Darwin published his well-known book The Origin of Species, which simply took every previous notion and finding on the theory of evolution and placed it within the same text. This Pandora’s Box of secrets was what the world was waiting for with baited breath. The question, however, was if Darwin was the first to arrive at such conclusions. He was not. Close to seven years prior, Herbert Spencer had published a pamphlet entitled “Theory of Population”. Spencer wrote, “those left behind to continue the race are those in whom the power of self-preservation is the greatest—are the select of their generation. (Dagg) Quite a Utopian ideal, and furthermore, it embodied what Darwin had stated within his book The Origin of Species. The idea that a single cell, with certain influences, could become a man in the span of twenty years was not that absurd. Furthermore, if we look forward millions of years, is it possible that one single cell could give origin to the human race? This was the previous conception of Spencer’s life works, occurring before Darwin’s publication ever took place. Additionally, Jean Baptiste de Lamarke had concluded that certain characteristics could be passed on to the offspring. This was, of course, suggested previously by Erasmus Darwin, the most well-known example being the neck of the giraffe that resulted from stretching to reach higher vegetation during a drought (Sunderland 14). 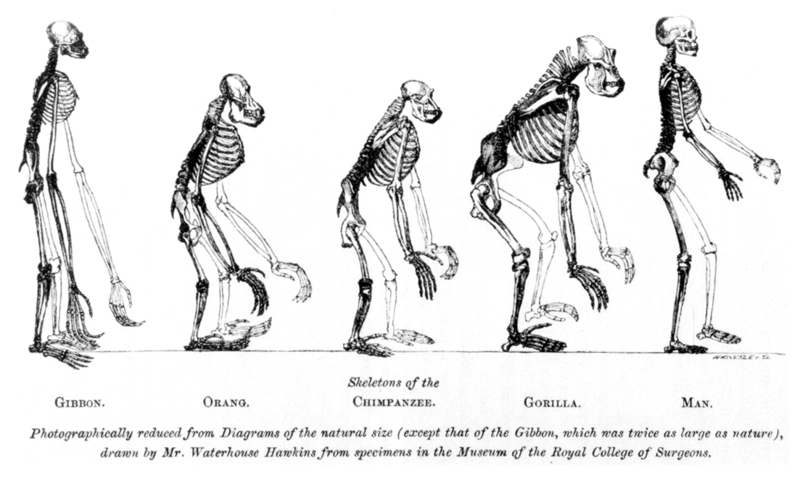 Lamarck criticized evolution, but even so, Charles Darwin often was inclined to use Lamarck’s findings within his book. Once again, the book read as if this was the first time the subject had been discussed, and Darwin conveniently pretended that he had stumbled upon the idea when he was on his five year journey on the HMS Beagle. Darwin’s principle of preservation, as reverentially stated in his Origin of Species, is what he boldly described as natural selection. The statement clearly reads that Darwin coined the term and there wasn’t a long history of its origins. His failure to acknowledge any previous contributions including Lamarck, Spencer, and even his own grandfather Erasmus, made it seem that he’d laid claim to the theory on his own. His hypothesis, however, lay challenged by a science that he once thought of as dull. In the event that fossils could have been proved as appearing suddenly, without the evidence of a common ancestor, this would have demolished Darwin’s Theory of Evolution. When Darwin initially started to write The Origin of Species, the fossil record was quite lacking in a transitional series of fossils. Some species, such as whales, appeared suddenly within the fossil record, without known ancestors. However, with further investigation, Darwin came to the conclusion that fossils found in adjacent layers had more in common than samples taken from separated geological land masses. Furthermore, the very basis of geological formations is the layers of settlement or rock and the sequence of time in which these layers are gaged. Consequently, when Darwin started to study fossil marsupials, he discovered they were only found in Australia. Since modern marsupials only live in Australia, it would only make sense that the modern marsupials descended from the fossilized ones (Coyne 26). Charles Darwin just couldn’t find enough archaeological evidence to prove that certain fossils descended from common ancestors. The evidence, however, today is changing and evolving. As paleontologists study transitional forms more in depth, they are turning up several hundreds of fossil samples that have yet to be tested. A problem arises, however, when we look into multicellular organisms. These forms of life only originated in the last 1500-600 million years, and that's just an estimate. Multicellular organisms are comprised of completely different cells and are highly specialized, which of course, doesn’t completely disprove Darwin’s theory. Over the past couple of years, a gradual change in the species has been found within the lower and upper layers of the stratum. For example, the fossil heart urchin genus Micraster gives an excellent example of continuous evolution of individual characters. The changes, however, appear to be independent of changes in those environmental conditions which have left their mark in the formation of the sediment (Nichols).Subsequently, when paleontologists consider the research that Darwin performed on Trilobites, which basically stated that the fossils must have evolved from a common ancestor long before the beginning of the Cambrian, they find flaws in the research. Further archaeological research has failed to reveal the Precambrian strata rich in fossils of multicellular animals which Darwin believed must somewhere exist (Darwin, and Leakey 163). Unfortunately for Charles Darwin, geologists have not been able to find fossils from periods earlier than the Cambrian system, therefore his fear that the lack of fossils could ultimately disprove his evolutionary findings is slowly becoming a reality. In Darwin’s defense, however, I lay down this hypothesis. If we consider where the Atlantic Ocean is located and if it was actually a continent at some time, it makes perfect sense that there would be layers of sediment that predate the Cambrian. This would then, quite surprisingly, allude to the existence of a past civilization that surpasses all documented history. For centuries, the age old debate over evolution and creation has puzzled scholars and influenced scientists and archaeologists to investigate the theories using cold, hard evidence. The problem is, you don't need evidence to prove evolution exists. It's already a fact so what is being tested? Furthermore, Darwin may have introduced a revolutionary ideal for the masses to ponder, however he did so in an underhanded fashion. Newton may have stood on the shoulders of giants, but he shared that influence with the world. The same cannot be said for Darwin. Coyne, Jerry. Why evolution is true. 1st ed. New York, New York: Viking Pr, 2009. 26. Print. Dagg, Joachim. "A Theory of Population, deduced from the General Law of Animal Fertility." Victorian Web. Brown University, 31/08/2003. Web. 16 Mar 2010. Darwin, Charles, and R.R. Company. The Origin of Species. London, England: Signet Classic, 2003. Print. Nichols, D. "Changes in the Chalk Heart-Urchin Micraster Interpreted in Relation to Living Forms." The Smithsonian/NASA Astrophysics Data System. NASA, 08/11/1956. Web. 16 Mar 2010. Sunderland, Luther. Darwin's Enigma. Rev. ed. Santee, California: Master Books, 1984. 10. Print. 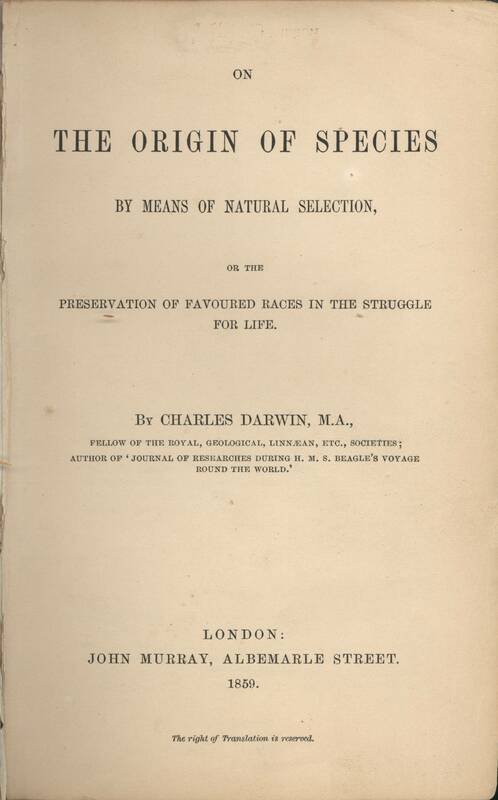 Read the entire thing; never knew Darwin was like that... not a fan of his anyway for personal reasons but as you said he stood on the shoulders of others. Modern evolutionary synthesis is a school of evolutionary thought which incorporates the concepts of natural selection, mutations, and studies in population genetics. Funny I just watched the movie Inherit the Wind, such a great movie. Funny looking back how very divisive the theory it was when it first as brought into the public schools. I also believe that scientists are very competitive people within their field and for many spending entire life working on one project looking for an answer or breakthrough must be incredibly depressing at times, not to mention trying to fight the powers to be, to also get grant money to continue to stay on course of a project they devote their life into. It must be a real bummer for them when at the end they are no closer to finding out the answer then when they started.